"It's harder on the tendons and joints. Also, training is different. A long run might be two or three hours. A long ride might be eight." -Lance Armstrong talking about the pounding on the body in running. Lance is running Boston this weekend. Message board thread here. *Ryan Hall to Be In Boston This WeekendUSA Today He told us he's going to the Red Sox game. We told him he should be throwing out the first pitch. Runnerville Podcast Matt Taylor is the only guy good enough to make it as a letsrun consultant, so you should listen to the show. Amby Burfoot talks about winning Boston in 1968, plus Toni Reavis has audio interviews from the 70s with some Boston legends. Great News: Boston Marathon To Put Sponsors Ads At Start & Finish and Increase Prize Money By 38% Giving the sponsors more exposure has enabled Boston to increase its prize money from $575,000 to $796,000 - making it the 'richest' of the world marathon majors. The fact that Boston has finally become PR-savvy enough to brag about it being the richest of the world marathon majors (when in reality it's one of the poorest) may finally show that Boston has joined the modern era of professional marathons. All we can say is, it's about time. *A Look Back At Last Year's Race - Just How Close Was it To Being Cancelled? 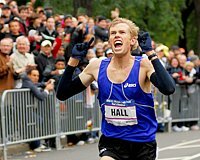 *Ryan Hall Wins USA Today Weekly Olympic Athlete Of The Week Award We sure hope a 2:06 would win it. *Wejo Points Out Lel May Have Not Been Youngest To Win 5 Majors Frank Shorter won 5 majors by the age of 27, assuming you count Fukuoka as a major (which it certainly was in the 1970s), as well as the Olympics. Really it's a moot point as it's a totally different era. Post-Race Recap : After Sunday's Win, Martin Lel is Now Convinced he Can Get World Record In the day after the press conference for the men's and women's champions, Lel says he thought midway through the race on Sunday that they were going to run under 2:04 before the conditions turned bad. He is now convinced he can get the world record and get it in London (which prior to yesterday he thought was impossible). *An Interesting Look at What Wanjiru Was Saying To The Kenyan Press Prior to London He said he was fit and wanted to run 2:05. He did that - and lost. LetsRun.com Ryan Hall's Coach Terrence Mahon Assesses Ryan's Chances "I would not be surprised if he won the race on Sunday" We sat down and talked to Mahon about Ryan Hall's meteoric rise in the marathon, expectations for Sunday, the pressure Mahon feels in coaching Ryan and Deena, the mental side of coaching, the 1:02:30 half way pace, and much more. Text and video above. LetsRun.com! Wejo Speaks: Friday in London (With Ryan Hall) Wejo goes behind the scenes and tries to give you a little glimpse what's it's like marathon week in London. Ryan tried to keep himself entertained by watching a match race over 800m between his wife Sara and his coach, Terrence Mahon. LetsRun.com! London Tidbits Bank of America Chicago Marathon inks with Nike, Paul Tergat's military commitment, Kenyan athletics taxes, Kenny B and of course Alan Webb. *Friday: Ryan Hall Update: 34:25 Video Interview. We'll have more on Ryan, and our 2008 Flora London Marathon Predictions by Saturday but are putting this up now. Worth the Wait (Wejo Was Impressed When he Read it): LetsRun.com Week That Was We give our exclusive analysis of the last week in the running world and the incredible Flora London Marathon. We put London in perspective, debate where Ryan Hall's run ranks in the history of American running, point out he was on 2:05:49 pace at the 25 mile mark, and rip into the LA Times. In non-London action, we praise Lopez Lomong (and wonder if Lopez had run the 1500 last year at the US champs, if Bernard Lagat would have even made the US team (he was 3rd at the US Champs),Chris Derrick, and others. Plus, we may finally end the American love affair with Gabe Jennings. Bizarre: Phillips Idowu Dumps His Coach of 10 Years This is after he won world indoors and set a GB record. Matt Tegenkamp Reflects On His 3:40 Outdoor Opener He is "satisfied" with the race and impressed with AS's crowd, which is a way bigger crowd than at Stanford. Scott Bauhs Gets Praise for His Sub 4 We're glad to see him get praise although the article isn't very good. The sub 4 is far from his most impressive thing to date. *Our Favorite TV Announcer, Ato Boldon, Speaks Out: Not sure if he's talking about Mo Greene or Heredia, but either way this is a great quote. "One thing is clear, that the evidence and the facts will show someone to be a fraud and someone will be vindicated. I will make no further comment regarding this case until such time." Ato's website's Motto is "Drug Free Since 1973"
43 Yr. Old Jamaican Sprinter Raymond Stewart Denies Heredia's Accusations Stewart says he didn't do any of the things Heredia told him to do in an email. Namibia's Star 800/1,500 Runner Agnes Samaria Not Happy She's Told She Has To Hit Olympic Times Again This Year You'd think a 1:59 and 4:05 from last year would be god enough to guarantee a spot in tiny Namibia. 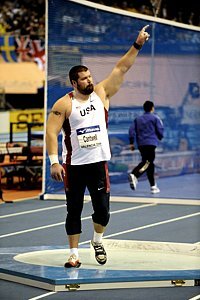 IAAF Comes In To Defend Greene - The world governing body said that before they made Greene an ambassador for the sport they did look into whether he was a doper and didn't find anything. Isn't this a tacit admission that they know the doping tests aren't effective? *IAAF: 'None of this is new"
*Sue Mott Column: Maurice Greene Is Just Latest Sprinter To React To Drug Accusations With Outrage Anyone remember Marion Jones' reaction? Former E. German Sprinter Katrin Krabbe Insists She Was Clean Sadly the "E" before the German doesn't give her much leeway with us. Liu Xiang To Run in Reebok Grand Prix in NYC - 1,500 extra seats are being brought in to meet extra demand expected for the May 31st meet. *Kim Smith Reveals All The New Zealand star talks at length about running, beer, and her fortuitous move from McNeese St to New Zealand. She says despite being NCAA champ in xc, she doesn't think she's a very good cross country runner and despite running a 4:24 indoor mile, she'll never have a good kick. She ends the interview with 6 off topic questions including whether she deep down wants Nick Willis to trip and fall. She concludes by saying "you can make Americans believe some pretty interesting things." *Bruce Hyde Interview - The former Cornell star talks about the keys (poker/beer) to his breakthrough "3:55 mile," plus he picks his 1,500 Olympic team and talks about Abdi's sweet rims and what it's like to live with a living legend in JK. *Lopez Lomong Smokes Matt Tegenkamp, Chris Solinsky and Jonathon Riley in 1,500 Lomong is the real deal. Scary to think that either Lomong, Manzano, Webb or Lagat will not be on the Olympic team. Maasai Mania Comes To America: *Great NPR Interview of Greenforce Director About Maasai's 1st Few Days In Britian Snow was a huge shock to them. *Maasai Learn To Quickly Love Tea With 10 Spoonfuls of Sugar Imagine how great sugar would be if you never had it before. They also are obsessed with Coco-Pops. They aren't worried about the marathon at all. *Maasai Impressed By Flatscreens & Shrek They like the donkey in Shrek, as they have donkeys at home. Apparently, our 2004 April Fools edition was the best as a woman wrote us saying she "should not be forced to read an entire article" without knowing it was true and we would be lucky to escape a lawsuit.